Out’n About! administrative users can add and delete users, modify any users information, create reports for any user, and change any users status and status message. Administrative users are identified by two asterisks (**) after their name on the In/Out Status Board. Out’n About! receptionist users can create reports for any user and change any users status and status message. Receptionist users are identified by one asterisk (*) after their name on the In/Out Status Board. User Normal Out’n About! users can only change their status, status message, and user information. The Out’n About! for Outlook system identifies users by the e-mail address. The Out’n About! 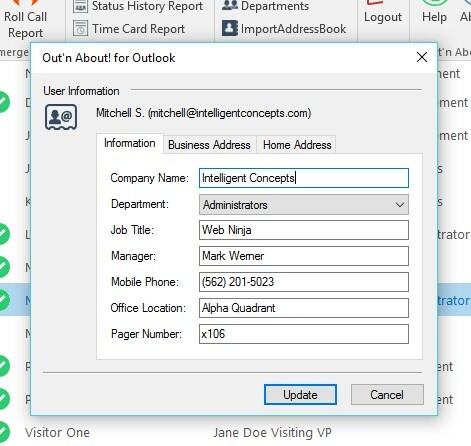 Address Dialog will automatically populate all information if you enter an e-mail address of a contact in your Outlook address book that is not currently included in the Out’n About! system. As an administrator you can import users from the Outlook Address Book/Exchange Global Address List (GAL) by opening the Administration Menu, and selecting the “Import from Address Book…” menu item. All imported users will have blank passwords and their User Information will be populated based on Address Book contents. User’s must have First and Last name information populated or they will not be added to the system. As an administrator you can delete any user from the In/Out Status Board by selecting the user, opening the User Administration Menu, and selecting the “Delete User…” menu item. The system will prompt to ensure that you really want to delete the selected user. As an administrator you can add or remove administrative and receptions user privileges to any user by selecting the user, opening the User Administration Menu, and selecting the appropriate menu item. For example, to make a user and Administrative user, click on the “Enable Administrator Mode” menu item. As an administrator you can reset or change any user’s password by selecting the user, opening the User Administration Menu, and selecting the “Reset Password…” menu item. The Out’n About! 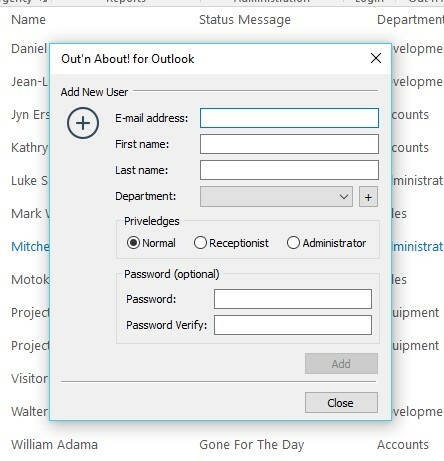 for Outlook system maintains information for each user in the database. This information is typically maintained by the user and is used to display information about the user on the In/Out Status Board and is also used by other users to synchronize their contact information in Microsoft Outlook. You can modify any user’s information by selecting the user, opening the User Administration Menu, and selecting the “User Information…” menu item.